Real Madrid central defender, Pepe, is reportedly a transfer target for Manchester United, Chelsea, Manchester City, and Barcelona, after contract discussions have slowed. Pepe wants his current salary to be more-than tripled to a 6 million euro per year deal. Real is only willing to offer him five, so the negotiations have stalled. Manchester United are looking for an experienced replacement for the injury-prone Rio Ferdinand. Manchester City are interested in everyone at the moment, but the citizens may be one of the only clubs that can meet him financial demands. Pepe has been at the heart of the Real Madrid defense this season, forging an iron-clad partnership with Ricardo Carvalho. With Pepe’s contract set to expire in 2012, it may be the time for him to leave. Werder Bremen striker Hugo Almeida is apparently in negotiations with Valencia over a proposed transfer to the Mestalla this January. 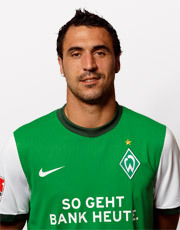 Almeida, whose contract expires in January, is the ideal target for the Spanish club, who is in need of strikers. Valencia officials hope to get Almeida on a free transfer. Let’s see…First Bayern, then Liverpool, then Chelsea, then A.C. Milan, now Barcelona. It’s no wonder that these big clubs are following the winger given his performances for Benfica and Portugal. Just think… A year and a half ago, Coentrao was a doubt to even make the Benfica first team. Now, he is a starter for the Portuguese National Team and one of Benfica’s key players. Coentrao, however, is not prepared to leave. Vitoria Guimaraes midfielder Joao Ribeiro, who was recently called up to the National Team, is on Fulham’s wish-list. Ribeiro has been in top form for Guimaraes, and it has apparently not gone unnoticed. The midfielder is thought to be valued at around 4.5 million euros, a price that Fulham is willing to pay. Ribeiro was bought for free from Academica this summer, so a 4.5 million dollar profit doesn’t sound too bad, does it? CSKA is also apparently chasing the 22 year-old. No more information on that bit, unfortunately.